Quartz crystals use the piezoelectric effect to convert the incoming electrical impulses into mechanical vibrations. These vibrations are affected by the mechanical resonances of the crystal, and as the piezoelectric effect operates in both directions, the mechanical resonances affect the electrical stimuli, being reflected back into the electrical circuit. Today, quartz crystal filters can be designed with pass bands ranging from frequencies in the kilohertz region up to many Megahertz - with the latest technology this can rise to 100 MHz and more. However for the best performance and lowest costs the passband of the filter is generally kept to below about 30 MHz or so. Using these way you can confirm if your Diode is working or not. Kingtronics diode include: M7, 1N4001S-1N4007S, 1N4001-1N4007, 1N5391-1N5399, RL201-RL207, 1N5400-1N5408, 6A05-6A10, FR101-FR107, 1N4933-1N4937, FR151-FR157, FR201-FR207, 1N5817-1N5819, 1N5820-1N5822, LL4148, BZV55C & ZMM55C, RS1M, SM4007 melf, UF4007.If you are interested in these diode, welcome to visit www.kingtronics.com. A Tantalum Capacitors is comprised of a permeable tantalum center section surrounded by tantalum pentoxide ,A tantalum wire is inserted into the center section and then extends axially from the component .The tantalum pentoxide layer is coated with manganese dioxide graphite ,a silver conductive coating and (finally) solder. Since 1960,tantalum capacitors have improved due to advances and development of higher charge tantalum powders ,directly contributing to the design of smaller tantalum capacitors. 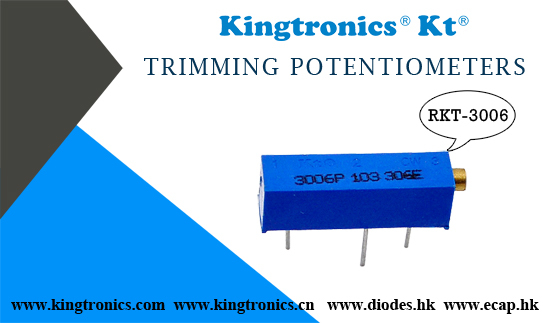 Kingtronics has manage TKT CKT and EKT series of tantalum capacitors, They are all widely used in many mass produced items of electronics equipment. 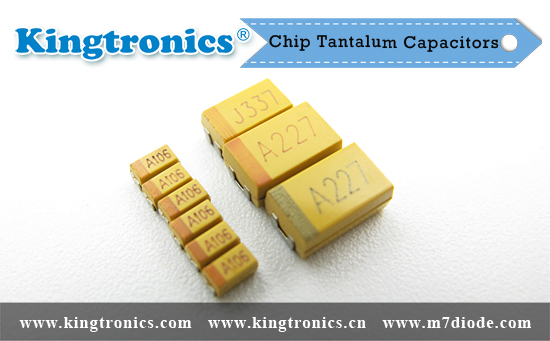 Kingtronics ‘s Tantalum Capacitors are very popular in overseas market , For more informations please visit www.kingtronics.com , the detailed PDF will give you a satisfied answer. Quartz crystals have piezoelectric properties; they develop an electric potential upon the application of mechanical stress. An early use of this property of quartz crystals was in phonograph pickups. One of the most common piezoelectric uses of quartz today is as a crystal oscillator. The quartz clock is a familiar device using the mineral. The resonant frequency of a quartz crystal oscillator is changed by mechanically loading it, and this principle is used for very accurate measurements of very small mass changes in the quartz crystal microbalance and in thin-film thickness monitors.Our Kingtronics short for Kt (logo) crystals are widely used in the oversea market. Kingtronics offers leaded quartz crystal HC49U, HC49S and SMD quartz crystal HC49SMD. Tantalum electrolytic capacitors exploit the tendency of tantalum to form a protective oxide surface layer, using tantalum powder, pressed into a pellet shape, as one "plate" of the capacitor, the oxide as the dielectric, and an electrolytic solution or conductive solid as the other "plate". Because the dielectric layer can be very thin (thinner than the similar layer in, for instance, an aluminium electrolytic capacitor), a high capacitance can be achieved in a small volume. Because of the size and weight advantages, tantalum capacitors are attractive for portable telephones, personal computers, and automotive electronics. Kingtronics short for Kt (logo) produce tantalum capacitors since 1997, include dipped tantalum capacitors (through hole capacitors), general purpose chip tantalum capacitors (surface mount) and Low-ESR chip tantalum capacitors (surface mount).We have a full instruction about Tantalum Capacitors in our website www.kingtronics.com each series of Tantalum Capacitors have detailed PDF and other information. Rectifiers find a use in detection of amplitude modulated radio signals. The signal may be amplified before detection, but if un-amplified, a very low voltage drop diode must be used. When using a rectifier for demodulation the capacitor and load resistance must be carefully matched. Too low a capacitance will result in the high frequency carrier passing to the output and too high will result in the capacitor just charging and staying charged. 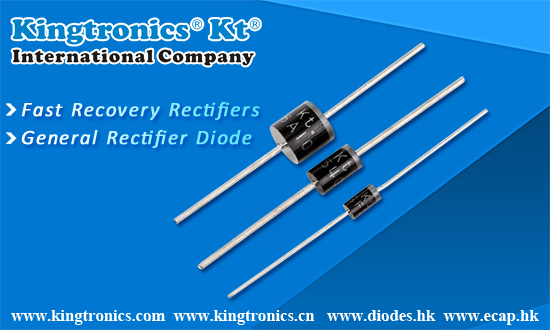 Kingtronics’s fast recovery rectifier diodes are very popular in the overseas market, According to the rectifier’ s application , Our Kingtronics managing ordinary rectifier diodes, ultra-fast rectifier diodes. In our Kingtronics website www.kingtronics.com ,we have detailed PDF about all kinds of diodes & rectifiers. The steady-state and dynamic reliability of a tantalum capacitor are influenced by several factors under the control of the circuit design engineer. These factors are voltage derating, ripple current and voltage conditions, maximum operating temperature and circuit impedance. Tantalum capacitors possess very low electrical leakage (high leakage resistance), and will retain a charge for a long duration. They are tolerant of hot operating environments up to 125 °C, unlike standard aluminum electrolytic capacitors. Tantalum capacitors are relatively expensive, particularly the military grades. They are not particularly tolerant of heavy charge and discharge currents, particularly those of a repetitive nature, and their effective series resistance (ESR) can be high when compared to ceramics or aluminum electrolytics. 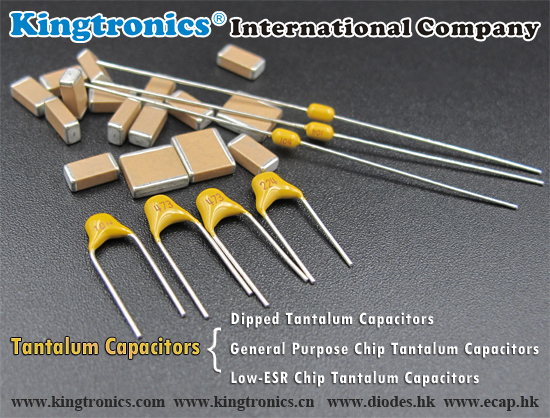 Kingtronics produce tantalum capacitors since 1997, include dipped tantalum capacitors (through hole capacitors), general purpose chip tantalum capacitors (surface mount) and Low-ESR chip tantalum capacitors (surface mount). Zener diodes are used to maintain a fixed voltage. They are designed to 'breakdown' in a reliable and non-destructive way so that they can be used in reverse to maintain a fixed voltage across their terminals. Kingtronics supplies BZV55C/ZMM55C-SERIES with Low zener impedance,Low regulation factor,Glass passivated junction,High temperature soldering guaranteed:260 C/10S at terminals. 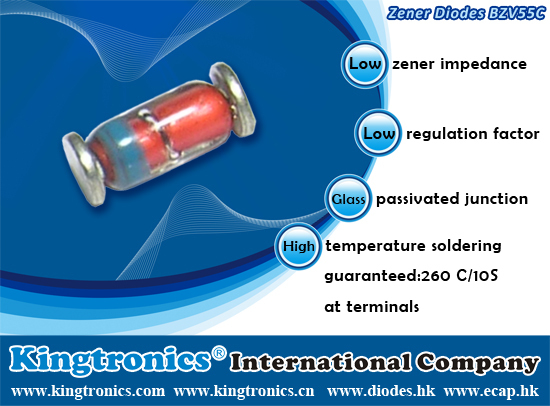 Please link http://www.kingtronics.com/pdf/BZV55C.pdf ,you will see all series of our Zener diodes. A crystal or crystalline solid is a solid material whose constituent atoms, molecules, or ions are arranged in an orderly repeating pattern extending in all three spatial dimensions. The scientific study of crystals and crystal formation is known as crystallography. The process of crystal formation via mechanisms of crystal growth is called crystallization or solidification. The word crystal is derived from the Ancient Greek word κρύσταλλος (krustallos), meaning "rock-crystal" but also "ice", from κρύος (kruos), "icy cold, frost". The word once referred particularly to quartz, or "rock crystal". Electronic-grade quartz crystal is single-crystal silica which has properties that make it uniquely useful for accurate frequency controls, timers, and filters in electronic circuits. These devices are utilized for a wide variety of electronic applications in communications equipment, computers, aerospace hardware, instruments for commercial use.